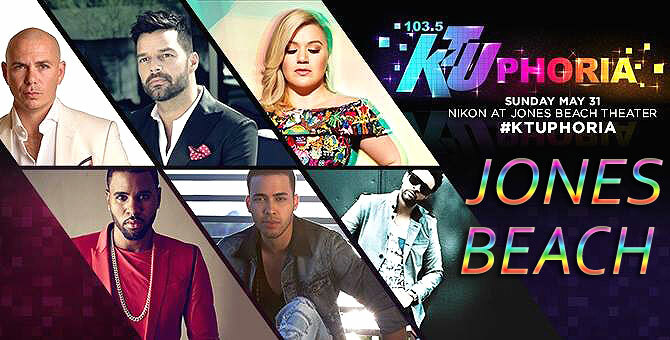 WKTU (103.5 KTU, The Beat of New York), unveiled the star-studded line-up for its ultimate summer dance party concert event, KTUphoria on Sunday, May 31, at 6:00 p.m. EST at Nikon at Jones Beach Theater in Wantagh, NY. This morning, KTU’s on-air personalities Paul “Cubby” Bryant and Carolina Bermudez, of Cubby & Carolina In The Morning, officially announced the all-star line-up for KTUphoria 2015. The annual show will feature live performances by Pitbull, Ricky Martin, Kelly Clarkson, Jason Derulo, Prince Royce and Shaggy. KTUphoria 2015 will kick-off with the action-packed Pregame, the official pre-party celebration. The event, which is open to tickets holders only, will feature a party atmosphere, KTU resident DJ’s mixing, special artist appearances as well as interactive displays from some of today’s hottest brands. The event will take place from 2 – 5:00 p.m. EST on the concourse level at Nikon at Jones Beach Theater and will welcome fans of all ages. Adam Lambert, whose hot new single "Ghost Town" has raised expectations for his upcoming album "The Original High," will be added to the already star-studded lineup of KTUphoria at Nikon at Jones Beach Theater on May 31. The official announcement is expected on KTU/103.5-FM at noon from DJ Wendy Wild, with other special guests to be announced.